Super star Vijay, is one of the most charismatic stars in Tamil Nadu. 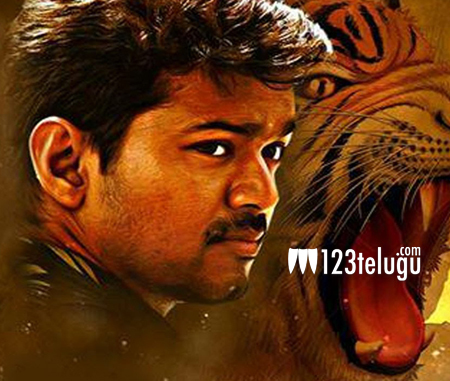 He is currently shooting for a big budget period drama Puli in the direction of Chimbu Devan. Shooting of this film is going on in full swing, and according to the latest update, a fancy village set worth 5.25 crores has been erected in the Talakona forest near Tirupathi. Reports reveal that Vijay’s introduction song will be shot in this set which will be a feast for all movie lovers. ‘Puli’ marks the comeback of Sridevi to the Tamil screen and she appears as a royal queen in the film. This film also has Shruti Haasan and Hansika as the female leads. Devi Sri Prasad is the music composer, while Shibu and Selvakumar produce the film under SKT Studios banner.